It is more about the lines and shapes, not the materials used. Last week in Outdoor Classroom, I looked at some of the alternatives to buxus and came to the conclusion that there is nothing that really fits the bill when it comes to low growing hedges. And it is the low and slow Buxus suffruticosa that is the worst hit by the dreaded buxus blight and the hardest for which to find a suitable substitute. Sempervirens is the common buxus and it will make a large shrub or even small tree if you don’t clip it. Handy little suffruticosa is a dwarf form of sempervirens and the option that is commonly used when you want a little hedge around 30cm high. Clipped hedges are essentially walls, usually green walls. Sometimes they are low walls, sometimes they are high walls but what they do is give some shape in a garden. The low, clipped box hedge is not about wind protection. It is largely about definition, formal lines and tidiness. The advent of buxus blight and the lack of an easy and cheap alternative to buxus may be a signal that it is time to look at alternative means of getting that definition. Maybe it is time to review the whole concept of tidy edgings and that is no bad thing where buxus hedging has become over-used and clichéd. Tarting up the vegetable garden and turning it into a potager was all the rage coming up to twenty years ago and I, too, fell into the fashion trap. It took a lecture by garden historian, Helen Leach, to wake me up. She pointed out in no uncertain terms that it was completely impractical to vegetable garden surrounding by little buxus hedges. Vegetable gardens rely on constant cultivation of the ground and invading buxus roots make that impossible. Besides, the hedge provides nice, sheltered conditions for snails and slugs to set up residence and she is not wrong there. I got rid of the hedging I had inflicted on Mark and Felix and would suggest that gardeners worrying about the buxus hedging in their vegetable patch (potagers are so passé these days; the least you can do is refer to it as the kitchen garden) just rip it out and pretty up the area in other ways. Pavers, possibly used as stepping stones, are a great deal more practical to get defined lines. Raised beds can be used to define space if you want to go down that path. A spot of clipped topiary or matched vertical accents, even a pair of urns can give definition without compromising the prime purpose of the productive garden. In the ornamental garden, it is a little different. Though after battling congested root systems to renovate mixed borders, I wouldn’t be wanting to use hedging as an edge- line for any gardens where I grow perennials or annuals which prefer not to compete for root space. Our preference is for more permanent materials which serve the same purpose without the maintenance and the problem of roots – in other words, low brick or stone walls about the height of a little buxus suffriticosa hedge, around 20 to 30cm. They take a bit to put in with poured footings and a mowing strip where laid beside lawn, but they are pleasingly permanent and they give the lineal definition that a low hedge also gives. Personally I prefer stone to brick, especially when it is a narrow, faced stone wall. I think it weathers better and looks wonderfully timeless without the slight garish aspect that even recycled brick can give but it is also the most expensive option in terms of time and requires a much higher level of skill to construct. We have been laying a low brick edging this week to formalise a previously casual, rather wayward area. It is a situation where it would have been common for many to go in with a low buxus hedge but it all serves the same purpose – to channel the eye straight down to a longer view, to give definition and form to that particular border and to stop the birds from dispersing the soil and mulch as they scratch around. When we lay any concrete here, be it path or mowing strip, we tint it so that it does not dry out that stark white in the initial stages. Sometimes we will go to exposed aggregate also so the new area looks instantly weathered. Concrete blocks laid and then plastered will serve the same function as brick or stone edging in getting the sharpest definition of line. If you are thinking to yourself that you like the softer effect of a hedge, that is what you achieve in the garden inside the edging where you can allow plants to froth over and blur the rigidity. In less formal areas, edgings can be done with natural wood. At Te Popo Gardens near Stratford, Lorri Ellis has used the device of stacking narrow lengths of branch not much thicker than 10cm in diameter, all cut to the same length and laid with the cut end visible, modelled on a tidy wood pile. It creates a visual barrier in the same way as a hedge and Lorri has planted against it to soften the view. Even ponga logs can define an edge and last for years, ageing gracefully. At Wisley in the United Kingdom, the long borders of classic herbaceous plantings are not edged in hedging to contain them. Instead big square pavers have been used. These guide the eye down the length of these parallel borders and protect the lawn because the exuberant plants just froth and flop on the pavers. If you are going to try the paver approach, experiment with different sizes. I suspect bigger is better unless your space is narrow. You can edge with rows of some clumping perennial. Grasses are often used, though it is not to my personal taste. I think it looks a bit suburban in mondo grass or lirope but if we all liked the same thing, our gardens would all be very much the same. In the end, it is not your buxus hedging that makes your garden look sharp and smart. It is the lines drawn with the hedging. So if buxus blight is forcing a re-think on you, maybe you don’t need another hedge at all. Having commented previously about the suffering from DEBBO (that is Death by Bloody Buxus Overload), I would welcome seeing some more creative and individual solutions to creating formal shapes and design in New Zealand gardens. As a postscript to last week’s Outdoor Classroom, I would reiterate what I have said before about other forms of buxus. Overseas research says that while suffruticosa is the worst hit by buxus blight, followed by the other forms of sempervirens (which is very evident now in Taranaki), no buxus variety is resistant. So while anecdotally there are reports locally that the Japanese and Korean forms (microphylla, microphylla var. koreana and sinica) are not affected, this may be more related to individual conditions. I certainly would not be recommending spending much time or money on replacing affected hedges with Japanese or Korean buxus. The picture will be clearer in five years time but at the moment it appears you run the risk of replacing one infected hedge with another which will become infected in due course. 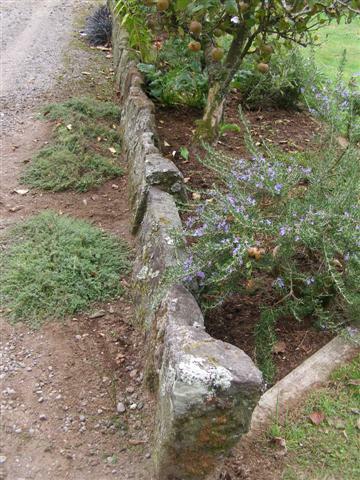 This entry was posted in Abbie's column and tagged Abbie Jury, buxus blight, Buxus hedging, buxus replacements on 23 April 2010 by Abbie Jury.